CTS Computer Tech Support has been in business since 2003 and is located in Destin Florida. The owner is a retired military veteran and has lived in this area since 1982. Our business has a large satisfied client base and we do our very best to ensure our service always meet the highest standards and satisfies customer needs. Our Shop is located at 305 Mountain Drive, Suite C, Destin. Florida. Our facility is an open shop which allows customers in the tech room so they can actually see the work being performed. We also give great advice and real solutions to computer related issues and also provide excellent computer enhancement ideas. We have special in shop rates for computer reloading, data transfers and virus removals. These specials are a flat rate in shop fee and help defer the cost of onsite maintenance. 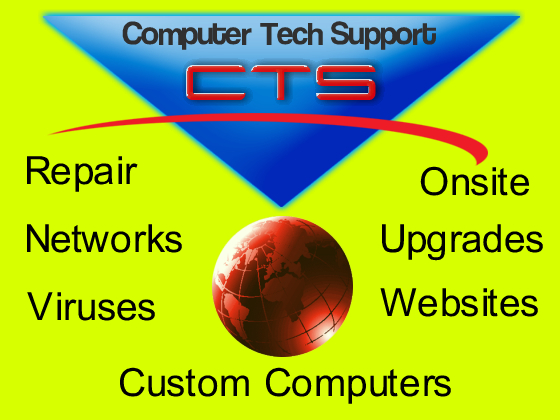 CTS does offer onsite services for clients, small, medium and large scale business customers. We will never charge a customer without prior knowledge of the computer issue. We always keep the customer informed of any subsequent problem during the maintenance process. Please call us with any question. We look forward to helping you.